It was glitz, glamour, gowns, and giggles at the 2018 Mrs. Indiana pageant last month! 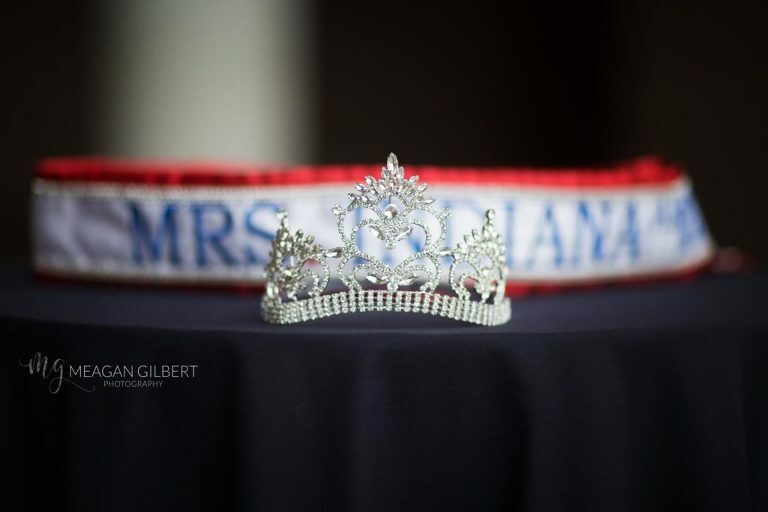 Meagan Gilbert Photography is the official photography sponsor of the Mrs. Indiana – America Pageant and we are thrilled to be able to capture the entire experience on camera. On April 21, 15 of the Hoosier State’s finest married women competed for the title of Mrs. Indiana. The pageant featured the reigning Mrs. America, Mekayla Eppers, and Indiana’s own Mrs. World 2002 as the emcee, Nicole Brink. The night before the pageant, the contestants and their husbands arrived at the Indiana Whiskey Company for a cocktail party to relax and get to know one another. We were ready bright and early the next morning to capture full photos of the contestants after they had their private interview with the judges. It was so fun to see everyone’s different personalities reflected in their interview outfits! Once the private interviews were over, it was time to get ready for the show where all of the contestants wore sponsored Mrs. Indiana tee-shirts from Maverick Promotions Inc. and beautiful shoes from Benjamin Walk Shoes. These ladies were definitely stylin’. The onstage production consisted of their opening number and competition that included swimwear, evening wear, and a question for the finalists. The swimsuits for the contestants were generously sponsored by SwartleyWest. Just like with interview outfits, it was so fun to see the gorgeous evening gowns worn by the contestants. Almost every color of the rainbow was represented and we loved seeing the different styles! When the judges got down to the final two, Kayzie and Justice shared such a sweet moment onstage while they waited for the results. These ladies were all smiles – a true testament to the bonds the contestants form during the weekend! Kayzie Weedman was crowned Mrs. Indiana – America 2018 and we are so excited to follow her journey to the Mrs. America pageant in Las Vegas. We’ll be providing her official headshot for nationals – stay tuned! We have so much respect for Mrs. Indiana – America Organization, its director, board, and volunteers for all of their hard work. It’s always such a great weekend and a wonderful show. We truly feel like the coolest people ever by being associated with such an incredible program. Do you need an updated pageant headshot? Mention this blog post for 10 percent off your next session! Fill out the contact form on my website or email me today for pricing and availability.